The story is: how did these two people happen to attend Pacific University at the same time? When Sally was a little girl growing up in the big city of Seattle, World War II was going on! Her family lived above Boeing Field, & air raid drills were practiced often. So this kept her family in fear. As Sally grew up, she didn't wish to be a Secretary or a Nurse. Boeing was a big opportunity for working and the University of Washington was a close place to go to school. Graduation from high school happened & the big decision had to be made. Washington State looked like a good opportunity, but there was nobody she knew was going there! Janet Zimmerman, one of Sally's high school friends, was going to Pacific University because her father was a minister at a Congregational Church in Seattle and she had free tuition. In the Fall, with a small suitcase & a small box in her hand, off to a city called Forest Grove Sally went! Janet and some of the other students met the train in Portland and drove her to Pacific University. Here was a beautiful campus that Sally knew was going to be home for the next four years. Sally joined Kappa Delta, where she met several great girls and became popular. Sally felt that when she was in high school, she was only one of the students in school, but at Pacific she became a person that had many dates, was outgoing and received some special personal awards. This went on for three years until her senior year, when at the first dance of the year, before school started, she met the person she was going to spend the rest of her life with! To keep the story going, we have to tell the story of the farm boy from the country. His name is Jack and he spent his young life fishing the small stream that ran past the farm, cutting hay and milking cows. Jack attended school only because each morning his mother would send him along with his brother and sister off to school. School wasn't what Jack was fond of, until sports became an important part of his life! Jack was successful in sports because of good coaching and that he attended a small school! After Jack's senior year in high school, he thought he would go to a Junior College and play football for two years, then go into the armed services. During his sophomore year, a Boeing representative came to the college to interview students and offer them jobs. Jack was one of them and he would begin work for Boeing that summer. Sometimes we think of things that have happened in our life, maybe they have happened for a reason? Jack, didn't only play football at Junior College, but he also ran track! While he was in the dressing room after track practice, a man in an overcoat appeared. Jack was the only person left in the dressing room. The man asked, "are you Jack?" He said yes, may I help you? The man said, “You are just the person I was looking for! I am Dr. Paul Stagg, a Pacific University football coach.” He said, "Would you be interested in playing football for Pacific University?" Jack thought for a moment and then said, "I would be honored to attend Pacific University and play football." Dr. Stagg disappeared just as he had appeared! Jack sat there wondering,"What just happened?" He had to pinch himself to make sure that this was real and he wasn't dreaming! Jack went on to graduate from Centralia Junior College and worked that Summer at Boeing in Seattle. At the end of Summer, Jack told Boeing goodbye and started down the road to find Pacific University. He had never been further south than Portland. With a map in his hand and his foot on the gas pedal, he finally arrived in Forest Grove. As Jack was driving past the football field, he saw what he thought was the football team already practicing. He further observed the practice, and knew that there was no way he could possibly make the football team! Feeling bad about getting there late and missing practice, he went over to some people watching the practice and talked to them. Jack was surprised (and relieved!) to hear that the team practicing was the Dallas Cowboys, the professional football team! They were using Pacific’s football field because they were going to have a pre-season game in Portland. Football practice started two weeks before school started. Most of the students arrived at Pacific the Friday before the start of school, so they could attend a dance to get acquainted. Jack attended to see and meet some of the girls who were on campus. 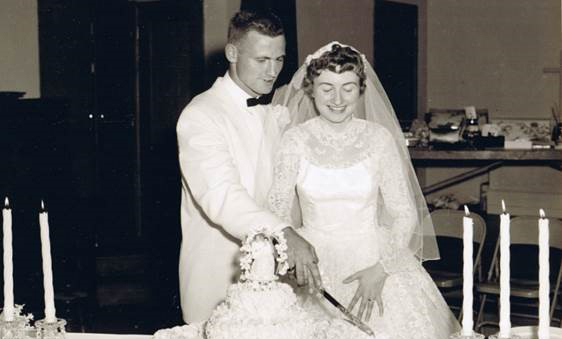 Sally Billeter and Jack Nehring got married Jack’s senior year. They were married for 59 years before Jack passed away in 2018.